31 August 2017, Singapore – With less than three weeks to the 2017 FORMULA 1 SINGAPORE AIRLINES SINGAPORE GRAND PRIX, race organiser Singapore GP Pte Ltd has unveiled a comprehensive fringe entertainment line-up to complement the festivities at the Marina Bay Street Circuit. 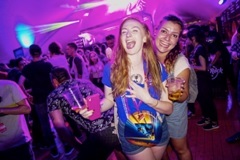 In addition to previously announced acts Calvin Harris, Ariana Grande, Duran Duran, OneRepublic, Seal, The Chainsmokers, Lianne La Havas and George the Poet, Singapore GP has added more support acts to amp up the excitement at Singapore’s tenth Formula 1® night race this 15 to 17 September. Race-goers are in for a treat, with a host of artistes performing across seven stages and throughout the 799,000 square metre Circuit Park. International support music acts performing throughout the Marina Bay Street Circuit include Canadian singer-songwriter Alysha Brilla, whose contemporary music draws on the influences of her Indian-Tanzanian roots, award-winning Malaysian rock band Kyoto Protocol, UK-based beatboxing trio Bloxed Beats and folk-pop, indie rock US band Cale and the Gravity Well. The night race will also see a record number of homegrown musicians making their debut at the Marina Bay Street Circuit. Waving the city-state flag proudly are two of the island's hottest hip-hop artistes, THELIONCITYBOY and ShiGGa Shay. Racegoers can look forward to performances by one of Asia’s leading vocal band, MICappella as well as chart-topping R&B singers Sam Rui, Vandetta and Tabitha Nauser. Just for the night race, Tabitha and ShiGGA Shay will collaborate and perform a song exclusively over the race weekend. Indie rock fans can catch the high-energy performances from Stopgap and Aarika Lee & The Next Movement. Fans too can party the night away with resident deejays Ghetto, LeNerd and Andrew Tang from iconic homegrown nightclub Zouk. Ticketholders can catch Australian performing arts company Strange Fruit as they enthral audiences with a large-scale visual spectacle ‘Spheres’ which fuses theatre, dance and circus at the Circuit Park’s newest entertainment zone at the Empress Lawn. 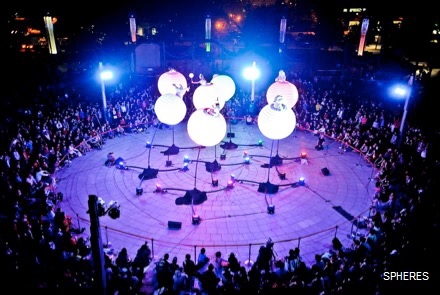 Set against the backdrop of the historic Victoria Theatre and Concert Hall, look out as four celestial beings emerge out of giant illuminated globes perched atop 4-metre high flexible poles in a whimsical tale of transformation and wonder. Join in the fun with the German group Groove Onkels as they perform at the Marina Bay for the first time, with a spectacular showcase of Latin percussion and rock music using trash cans, sticks and brushes. Groove to the beat with the award-winning DrumCat, an all-female drumming group from South Korea, or be captivated by the sounds of jazz, funk, Latin and hip-hop by Singapore’s very first New Orleans-style New Stream Brass Band. Ticketholders can also look forward to mesmerising acts geared towards the young, and the young-at-heart. Dressed in full detailed tree costumes, the wacky Treemendous Treants are game for fun picture opportunities that will make your friends green with envy. Another act that is hard to miss is CJ Bubble. With mega bubbles measuring 6 to 9 feet wide, CJ will wow audiences with her Instagram-worthy spectacular soap bubble creations throughout the Circuit Park. UK’s acrobatic moustachioed trio Acro-Chaps are set to delight the audience with their unique brand of comedy and astounding feats of strength while the unbelievably agile Lisa Lottie’s hypnotic ‘Bend it like Barbie’ performance will also have fans transfixed as she contorts her body while performing impressive hula hoop manoeuvres. Over at the F1 Village in Zone 1, fans of the Singapore Grand Prix can embark on a nostalgic journey through a decade of Formula 1® night racing with a photo exhibition featuring the event’s iconic moments, and marvel at a stunning display of vintage cars which will be used for the Formula 1® Drivers’ Parade on race day. Elsewhere, ticketholders can also look forward to interactive activities throughout the Circuit Park – change the tyres of the Formula 1® replica car in the Pit Stop Challenge, get yourself inked with a complimentary temporary tattoo at the Airbrush Tattoo booths or strike a pose at one of the many photo opportunities at the Marina Bay Street Circuit. Tickets for the 2017 FORMULA 1 SINGAPORE AIRLINES SINGAPORE GRAND PRIX start from S$78 for a Friday Zone 4 Walkabout pass. Seven ticket categories have now sold out, and another 16 ticket categories are selling fast. Tickets are available for sale at www.singaporegp.sg, via the ticketing hotline +65 6738 6738 as well as all authorised ticketing agents. The artiste line-up and schedule is subject to change. For more details on the 2017 FORMULA 1 SINGAPORE AIRLINES SINGAPORE GRAND PRIX programme line-up, visit www.singaporegp.sg.